Want to be notified of new releases in mozilla/patches? Pull request Compare This branch is 4 commits ahead, 2 commits behind Atelier-Arcadia:master. Patches scans your endpoints and servers for vulnerable package installations. Using the Clair API as a source of information about packages with known vulnerabilities, patches periodically performs a scan on a host for packages containing any vulnerabilities affecting the host. While it's extremely unlikely that this software would cause harm to your computer, it is worth noting that this software is considered to be in alpha. 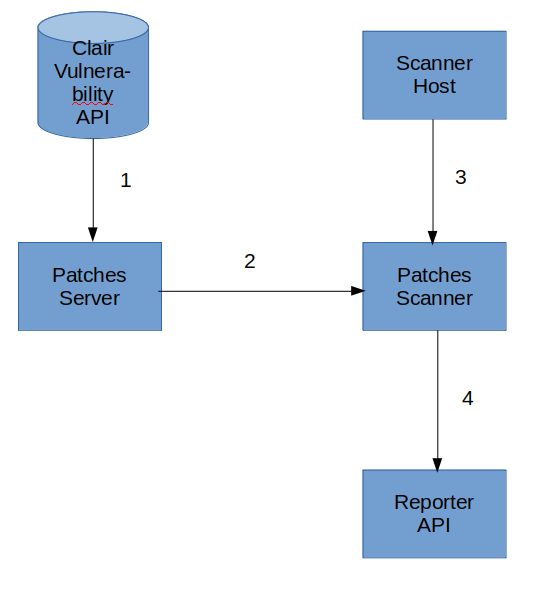 The patches-server reads information about vulnerabilities from Clair. The patches-scanner streams that information from the server. The patches-scanner then scans the host it runs on for vulnerable packages. Finally, the patches-scanner reports anything it finds to a reporter API. First, you must have a working Go compiler at this time as packages are not yet being built for patches. Follow the instructions on the official site to get a working compiler installed. You will see in the patches-scanner's usage output that it claims to support a number of different versions of Linux distributions. At present, patches only actually includes support for Debian and Ubuntu hosts. Support for the remaining hosts will come pretty soon, with any luck, but I'd be happy to help contributors. Running a patches-server locally will require running the Clair vulnerability API and its datbase inside of Docker. So you'll need that installed. # (1) Wait about ten or fifteen minutes for the Clair database to fill up. (1) - Clair, running in Docker, automatically updates its database with information about vulnerabilities affecting packages on a variety of Linux hosts. This process takes some time but can be checked on manually if you want to be sure. # 1. Get the identifier of the Clair API container. # 2. Open a shell instance inside of the Clair API container. #    look for its name in the output of the following. # 4. If your platform has data loaded for it, exit. The patches-scanner will report any vulnerabilities affecting he host it's running on to a "reporter API." This API is essentially expected only to accept requests containing vulnerability information encoded as JSON in the body and to indicate success with status code 200. # 1. Run the reporter API. The patches-scanner is the host utility that periodically streams information about vulnerabilities from a patches-server. When it finds a vulnerability affecting an unpatched package on the host, it will report this vulnerability to a reporter API. # 1. Build the scanner. # 2. Run the scanner. #    This step assumes you have a patches-server and Clair running locally. After about one minute, the scanner should start logging information about requests it's making to the vulnerability server and any findings it produces. All of the patches' unit tests can be run by invoking make. No formal process has been established for this yet. If you'd like to help out, please feel welcome to open an issue with any questions.